NEW! Listen to Ritch Shydner talk about KICKING THROUGH THE ASHES on “WTF with MARC MARON” and “Fitzdog Radio” podcasts! Listen to the “WTF with Marc Maron” featuring guest Ritch Shydner, author, Kicking Through the Ashes by clicking on the audio player below! The Huffington Post loves Ritch Shydner’s Kicking Through the Ashes! I started and finished this book because of my late mentor, Vic Anderson. When I met Vic in the spring of 2011, I was dead in the water. A year earlier, my stand-up comeback in Jordan Brady’s documentary, I Am Comic, fizzled like a wet bottle rocket. I came to Vic after a 13-day stint of staring at the ceiling in the UCLA Psychiatric Unit. I thank Alan Bursky for recommending Julian Neil, and Julian for sending me to Vic. At some point Vic asked what I once did to pay my bills. I said stand-up and comedy writing. Vic suggested I do them again, but for fun and for free. Like with no other person in my life, I did everything Vic suggested. The stand-up path was clear — free local performances soon led to pay-ing out-of-town gigs. I didn’t know what to do about the writing. Vic thought the stories I told about my past might be the sort of thing people would enjoy reading on Facebook. No one ever moved me like Vic. His very presence gave me a contact high. Listen to comedian Ritch Shydner talk to WGN Radio (Chicago 720 AM) personality Nick Digilio about his new book Kicking Through the Ashes by clicking on the image above! Comedian Ritch Shydner is one of America’s funniest and most enduring stand-up comics, a wry observer of life around him and a survivor of the 1980s comedy boom. Besides becoming a comic’s comic over the decades, he has starred on television’s “Married With Children” and won awards for his writing as a member of the “Roseanne” staff. Ritch Shydner on comedian Bill Burr’s podcast.Dozens of photos and index! In “Kicking Through the Ashes,” Shydner collects all of his 1980s life experiences — the good, the bad, and El Brookman’s — in one hard to put down memoir. He tells stories about Jay Leno, Jerry Seinfeld, Tim Allen, Carol Leifer, Richard Belzer, Johnny Carson, Andrew Dice Clay, Rodney Dangerfield, Tom Dreesen, Budd Friedman, Gilbert Gottfried, Bill Hicks, Sam Kinison, David Letterman, Bill Maher, Steve Martin, Jackie “The Jokeman” Martling, Rick Overton, Phyllis Diller, Kevin Rooney, Robin Williams, Richard Pryor and more! “This book is hilarious and heartbreaking, packed with stories that move and shake, much like the author.” — Margaret Cho, Comedian! Before Tim Allen, there was comedian Ritch Shydner on the “Bring Power Tools, Get in Free” tour! In the 1980s, Ritch Shydner made numerous appearances on TV, in-cluding Late Night with David Letterman and The Tonight Show with Johnny Carson and The Tonight Show with Jay Leno. He did an HBO half-hour special, One Night Stand. You may also recognize him as Al Bundy’s co-worker on Married with Children and from guest appearances on many other TV shows, such as Designing Women and Roseanne. He wrote for sitcoms such as Roseanne, The Jeff Foxworthy Show, and HBO’s The Mind of the Married Man. Shydner translated his modest success on TV into an obscure film career, appearing in Steve Martin’s Roxanne and Eddie Murphy’s Beverly Hills Cop II before moving on to minor roles in smaller pictures. He wrote material for Jeff Foxworthy’s Grammy nominated comedy albums Totally Committed and Big Fun. He also wrote for Ron White and Jay Leno. In 2006, Shydner was co-author with Mark Schiff of a book on stand-up, I Killed: True Stories of the Road from America’s Tom Comics. Four years later, he produced and performed in Jordan Brady’s award-winning documentary on the world of stand-up comedy, I Am Comic. You were married to comedian/comedy writer Carol Leifer, who is now married to a woman. Did that turn of events surprise you? Two women falling in love might have surprised me in junior high school but by the time I heard about Carol and Lori, I had seen a rodeo, a World’s Fair, and a moon landing. There were a few hacky nozzleheads who joked that I turned Carol gay. If I had that kind of power over people, I would have dropped comedy, started a church and made some real money a long time ago. I only wish Carol happiness, as I do any woman unfortunate enough to tangle with the younger me. You’ve done the Carson, Letterman and Leno shows? What was your overall experience doing each? Which was more fun? More nerve-wracking? Better for your career? Bob Andelman is the publisher of Mr. Media Books. He is also the host and producer of Mr. Media® Interviews and author or co-author of 16 books, including The Wawa Way with Howard Stoeckel, Building Atlanta with Herman J. Russell, Fans Not Customers with Vernon W. Hill, founder of Commerce Bank and Metro Bank UK, Mind Over Business with Ken Baum, The Consulate with Thomas R. Stutler, The Profiler with Pat Brown, Built From Scratch with the founders of The Home Depot, The Profit Zone with Adrian Slywotzky, Mean Business with Albert J. Dunlap, and Will Eisner: A Spirited Life. Click here to see Bob Andelman's Amazon Central author page. He is a member in good standing of the American Society of Journalists and Authors (member page). The Millionaire’s Convenient Arrangement by Jane Peden. Order your copy today by clicking on the book cover above! Published by <https://mrmediabooks.com>Mr. Media Books. Floater: A Novel by Tony Doris. Order your copy today by clicking on the book cover above! How to Handle the Bully at School by Christopher Rappold. Order your copy today by clicking on the book cover above! Be Your Personal Best: Confidence by Christopher Rappold. Order your copy today by clicking on the book cover above! In Our Time-Nostra Aetate by James M. Barrens. Order your copy today by clicking on the book cover above! Dirt: A Novel by Tony Doris. Order your copy today by clicking on the book cover above! A Daily Dose of Innocence by John Hutton. Order your copy today by clicking on the book cover above! 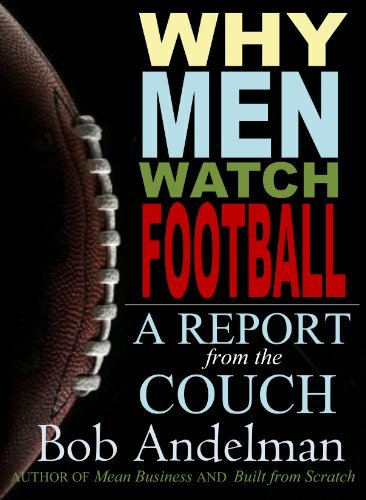 Why Men Watch Football: A Report from the Couch by Bob Andelman. Order your copy today by clicking on the book cover above! Mean Business: How I Save Bad Companies and Make Good Companies Great by Albert J. Dunlap with Bob Andelman. Order your copy today by clicking on the book cover above! Stadium For Rent by Bob Andelman. Order your copy today by clicking on the book cover above! Warrior by Christopher Rappold. Order your copy today by clicking on the book cover above!